Families looking for a fun place to stay may want to check and see if their vacation destination is home to one of the ten CoCo Key water park resort locations. These water park resorts can be a great place for a fantastic tropical getaway, no matter what the weather. Nine of the ten parks are fully indoors, while the tenth Orlando location is situated under a canopy. Each family-friendly water park is designed to make visitors feel as though they have been transported to the tropics. The indoor water wonderlands feature palm trees, constant 84-degree temperatures, and a slew of colorful decorations. Palm Grotto: These giant indoor/outdoor whirlpools are relaxing and soothing. Guests can even use the swim-through passage to go from one whirlpool to the other without losing a moment's enjoyment. Parrot's Perch: This island-shaped multi-level interactive play area has a zero depth entry to make it suitable for young visitors, but the water cannons, sprays, tipping bucket, and other splashtastic features will be fun for the whole family. Coconut Grove Adventure River: It may look like a lazy river, but Coconut Grove is actually a high speed tube ride that includes some wet and wild surprises for riders. Take a wild ride on this action river and enjoy the rapids, waterfalls, and other obstacles as you circle around Parrot's Perch. Coral Reef Cavern: Athletic visitors will love this activity pool with a floating lily pad maze, water basketball, and other features, all set amid an animated coral reef backdrop. Dip-In Kiddie Pool: The zero-depth pool features small slides for toddler and young kids, plus a few little tipping buckets. Plus, during special events, movies are displayed on a large sail screen above the pool. Water Slides: Gator's Gush, Barracuda Blast and Pelican Plunge are three 40-foot body and raft water slides offering wet and wild fun for older kids and adults. In addition to these signature attractions, each CoCo Key resort is also home to body and tube slides, outdoor tanning decks, varied eateries, an arcade, and other fun features. 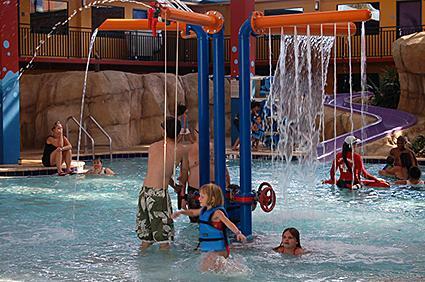 While the resorts do not include the larger attractions such as wave pools or water coasters common to some indoor water parks, the fun variety is sufficient to entertain guests for hours. Costs and policies vary from one location to another. Visit the website of the park you are interested in visiting for details. At some locations, admission is restricted to resort guests and is included in the cost of lodging. Some locations do sell a limited quantity of day passes based on the park's capacity and blackout dates. Day passes, where available, must be purchased online and in advance. Admission prices and lodging rates vary based on the destination, date, and time of day. Annual passes may be available at some locations. Group visits for birthday parties, fundraisers, and other events can be arranged. In addition to regular admission, the CoCo Key resorts frequently offer specialty packages and deals, such as spring break events, promotions combined with other local attractions, and discounts designed to recognize certain groups, such as veterans or grandparents. Evening tickets may sometimes be available at a discounted price. Interested guests should check each resort's promotional calendar for discounts related to blood drives, charities, and other special circumstances. The CoCo Key water park resorts can be fun for a quick getaway and a touch of the tropics. With a wide range of attractions, these unique resorts can be the perfect destination for families.